Manage hundreds of policies across different platforms through one central cloud portal. One interface applies browser policies across different platforms and OS versions from a single console. Rely on one tool for all operating systems. A single web interface alongside Chrome OS to set browser policies across Windows, Linux, and Mac. Easy policy management. Set and apply policies with only a few clicks. Simple sign up. If you don’t have a Google account already, easily create one and begin enrolling the browsers you want to manage. Visibility and browser inventory information helps IT make better management decisions and ensure security and compliance. Gain a better understanding of your browser landscape. 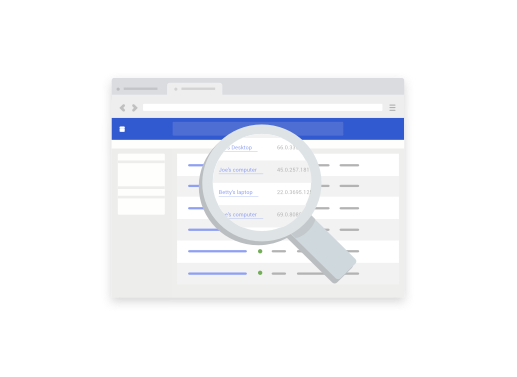 Easily get a comprehensive view of browser inventory information; including device details, browser version, extensions, and more. Support your governance and compliance efforts. View browser information across your entire organization or drill down to the individual browser level. 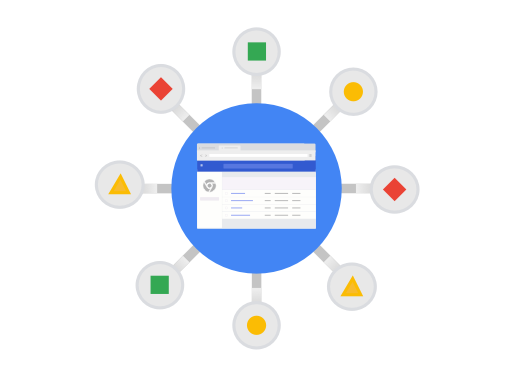 Google Admin console lets you choose how to delegate browser management to non-Windows admins. For all IT skill sets. With its easy-to-use cloud interface, no scripting or GPO knowledge is required for admins using Chrome Browser Cloud Management. Easy sign-on. The optional admin single sign-on through SAML makes it easy for IT to come in and out of the console as needed. Role-based access. Allow the main admin to set controls over who can make what changes within the system. Start enrolling and managing your browsers right away from the device management section of the Google Admin console. Easily begin or migrate your browser management to the cloud by getting started here. That's okay! You can also use group policy templates in our enterprise bundle to set policy for your browsers through Microsoft® Active Directory™. 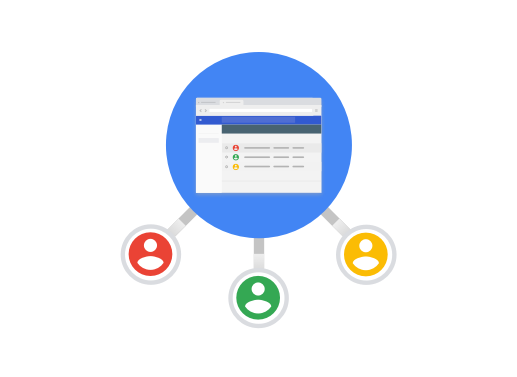 Get best practices, avoid potential disruptions, and minimize user downtime with 24/7 access to a team of Google experts. 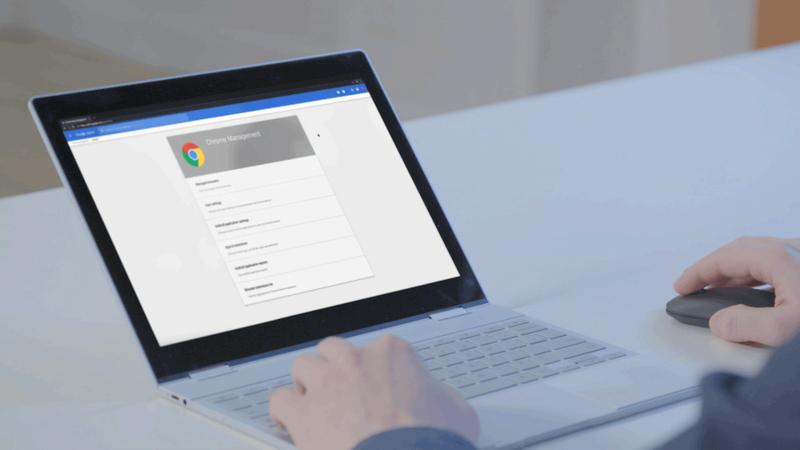 Dive deeper into Chrome Browser Cloud Management and learn how it benefits enterprises. 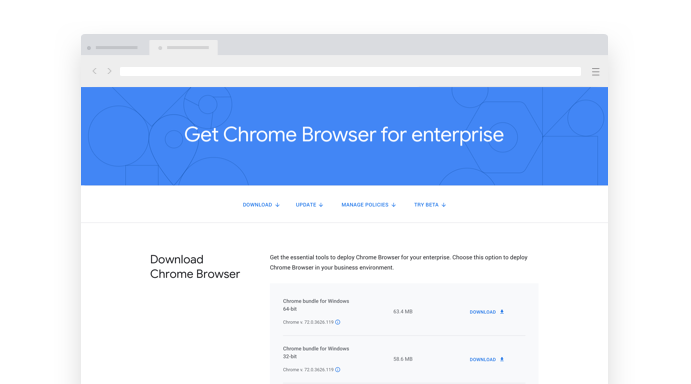 Check out these instructions for implementing Chrome Browser Cloud Management in your enterprise. Learn the basics about managing your browsers centrally from the cloud.